accommodation, dolphin & whale cruises, real estate, property investment & development, beach & rock fishing, Stockton sand dunes & surf web beach cams Australia. 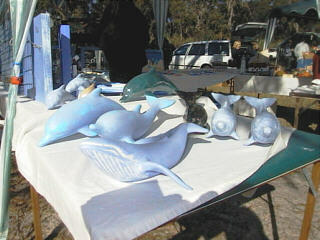 Port Stephens Markets - art, craft, produce, bric a brac, S/H goods. 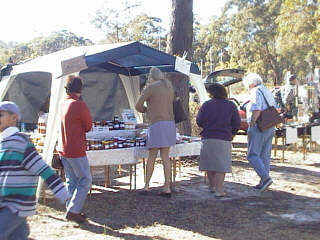 Every Sunday, Port Stephens plays host to a fantastic market. 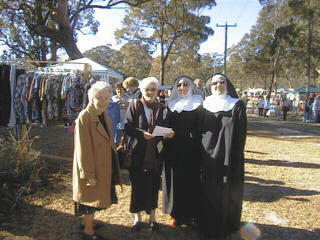 Stall holders from all over the district come to the markets to sell their wares. from stained glass to fresh fruit and veges, you sure to find something here to catch your eye. 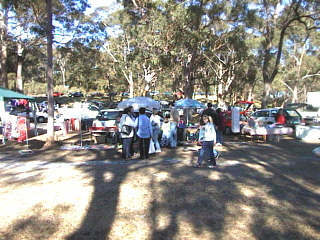 On the 1st and 3rd Sunday each month, the markets are held at Neil Carrol Park near the Nelson Bay RSL club. The easiest way to find this is to drive along the Nelson Bay foreshore towards Shoal and Fingal Bays and you will see the markets on the left hand side of the road just before the RSL club. Mantra Aqua Resort, Nelson Bay, Port Stephens - self contained spa apartments set around a resort pool and right in the heart of Nelson Bay. This is a stunning spa property, ideally located close to all the areas local attractions, overlooking the hypnotic waters of Nelson Bay. Your perfect base from which to explore the sand dunes and many secluded beaches, take a dolphin cruise or a whale watch cruise, go fishing, surfing or just stretch out on the beach and do nothing at all! You choose! Check online rates and package deals and book securely online. 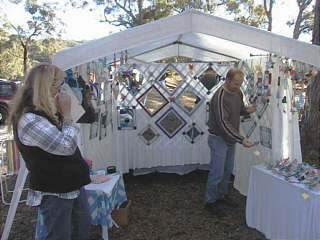 On the 2nd and 4th Sunday, you will find the markets at the Tomaree Sports Oval complex on the left hand side of Nelson Bay road. 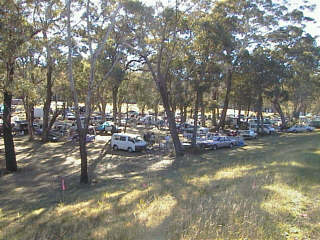 This is just after the main roundabout ( Nelson Bay rd/Salamander Bay ) on Nelson Bay. 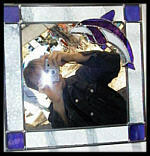 Stained Glass by Martine, a regular stallholder at the markets has a wonderful range of intricate leadlighting to choose from. 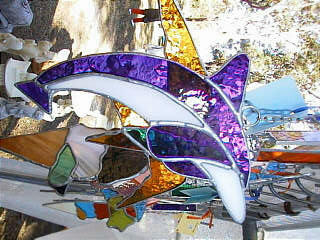 Have a look for yourself this weekend ... One of the hand fashioned pieces of leadlighting by Martine - looks absolutely beautiful with the sun shining through and glinting off the purple glass. Stephen Harris from 'Set in Stone' Garden Art with his range of garden ornaments, wall plaques, statues and patio pots. Stephen is also a regular at the markets. Audrey and Harry Nash have for sale their range of handmade pottery pieces and slip cast ceramics. Here's Bob ( and Mary in the background ) from Mac Scotia Sands Oz Originals. Definitely locals - moved here from Scotland. You can even buy a Humpback whale or a dolphin from Mac Scotia Sands Oz Originals. Copyright � 2000 Dunesnet.com. All rights reserved.